A scene that started with essentially just a hot dog cart, a pulled pork van under a bridge, and a burger with a cult following has become part of the everyday for Londoners as food markets pop up all over town. 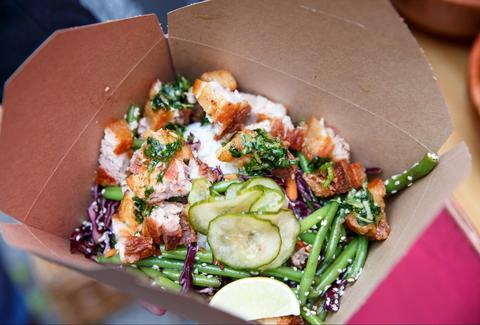 Traditional markets such as Whitecross Street, Broadway Market, and Brockley Market have lunch covered, and Street Feast’s night markets are ideal if you’re looking for a gourmet dinner on the go. News that Camden Market’s West Yard is about to be taken over permanently by street food collective KERB has blown north London’s menu options way open; it's promising up to 35 traders available seven days a week. With so much choice out there, you might like to draw up a short list before even leaving the house. These are the traders that have really made our tastebuds pop lately, serving up the ultimate meals on wheels. Makda Harlow grew up in Asmara, the capital of Eritrea, and the dishes she serves from her handsome, Art Deco-style stand at Netil Market reflect the unusual blend of African, Mediterranean, and Middle Eastern cuisines from her hometown. 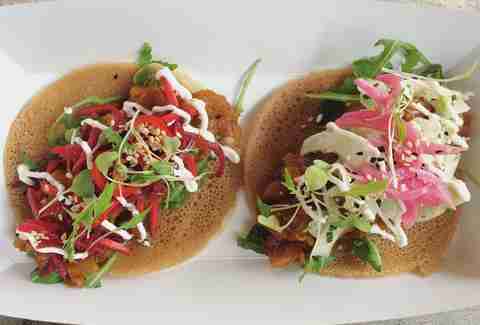 With so many influences, it’s no wonder her "Afro-tacos" are beautiful little carnivals of colour. Toppings such as spiced pulled lamb with cumin, carrot, and beetroot slaw soak into their spongy injera base, so you get an enormous pop of flavour in every mouthful. Those who can handle the heat should also save space for the awze hot sauce chicken wings, which come with a stuffed pepper & feta dip. This stand serves every Saturday and selected Sundays, and it's worth trying to claim a stool at the Lemlem stand itself so that you and Makda can talk through the menu. Vegan doesn’t have to mean bland, and these guys are here to prove it. The SpiceBox vegetable korma is an exemplary curry, rich with cashews and coconut and packed with perfectly cooked vegetables. Homemade pickles add a bit of tang and crunch, and your choice of rice makes sure your belly is fuller than the local curry house on match day. And it’s actually good for you, meaning that you can head straight for the nearest pudding afterwards without embarrassment. If you found SpiceBox at Druid St, St. JOHN's doughnuts should be your next victim. There’s a whole lot of tempting street food coming out of Taiwan right now (if you haven’t already braved the queue for BAO, then get on it STAT), and Dhan’s pillowy little waffles are up there with the best of them. Its wonderfully old-school waffle iron cooks the egg-sized treats until they’re perfectly crisp on the outside and dense but soft in the middle. Then they’re smothered in your sauce of choice. The sauce menu is so gloriously sugary that it could have been written by Augustus Gloop, so good luck choosing between fresh vanilla custard, Taiwanese peanut brittle, salty caramel, and Nutella. 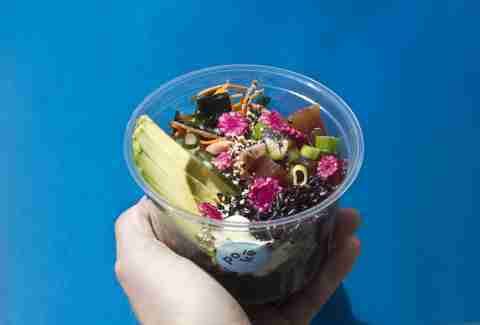 This Hawaiian speciality has swum straight into London’s food consciousness in 2016, but Poke was ahead of the tidal wave, starting out at KERB's markets mid-2015. A black rice base is topped with fresh raw fish in a shoryu sauce and colourful homemade pickles, creating the perfect jumble of textures and flavour. It also, conveniently for this day and age, creates the most Instagrammable bowl on the street. Hanna Söderland hit upon an irresistible mash-up when she created Kimchinary. You’d think the burrito could hardly get any better, but it turns out if you replace the Mexican ingredients with Korean ones, it gets even more delicious. The slow-cooked meats are fantastic, but don’t miss the grilled aubergine and ssamjang sautéed kale, which bulks out an already amazing pile of kimchee fried rice, sesame slaw, cheese, sour cream, and spring onions. Black beans are basically dead to you now. These guys have been cooking up Filipino masterpieces at markets across London since 2014, but their food hasn’t got any less unmissable. If it’s dinner you’re after, go for chicken adobo, a pile of sticky jasmine rice drenched in garlicky chicken stew and served with pickled edamame beans and carrots -- it's as hearty as it is fragrant. But it’s the lemongrass ox heart skewers that are unlike anything else out there, somehow rich and light all at once, and served with a tangy, spicy cane vinegar dip. An ice cream sandwich is always a good treat, but the Blu Top boys are piling together some truly unusual, special flavours from their cute little truck. You could go classic -- chocolate cookies, vanilla ice cream, that sort of caper -- but it’s obviously way more fun to play Willy Wonka and pile as many flavours as you can between the squidgy homemade biscuit bookends. Who could resist a peanut butter pretzel cookie, for starters? Or the Cop Car special -- white coffee ice cream stuffed with chunks of glazed doughnut? 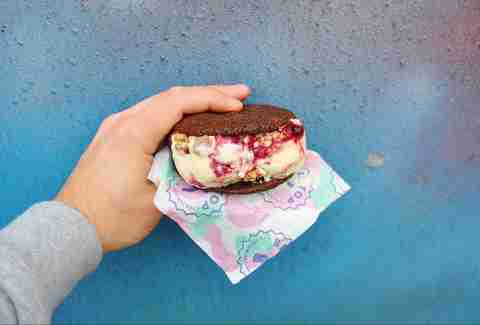 Their new stand at Camden Market means ice cream every day of the week, with plenty of sunny canalside spots nearby to devour it in. 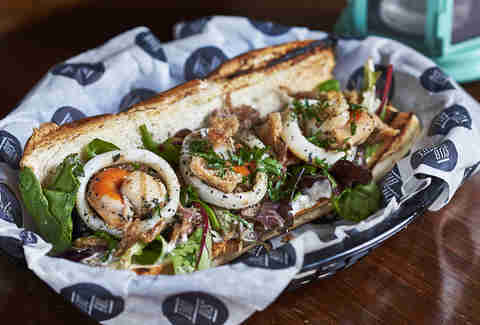 Ink's owner, Lucy Mee, is one half of Bill or Beak, whose bird-packed buns are the stuff of London street food legend. Ink has just started serving up crispy strips of salt and Szechuan squid accompanied by a rotating menu of pastel-coloured homemade mayonnaise dips. The stall will be open daily at Camden Market, and never fear, they’ve got that wild garlic dip here, too. 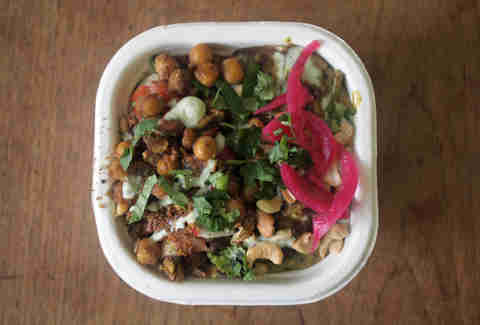 Ben and Gaz have been livening up London’s markets with more than great dishes; their mission is to put more soul in your roll, and you’ll certainly be entertained by Motown tunes and great chat while you wait for your order. But most importantly, their sandwiches are exquisite. The take on surf & turf involves scallops, squid, pulled pork, and a crisp sprinkle of crackling. Their vegetarian option, the Subterranean, is as good as any steak sandwich, all rich with juicy wild mushrooms and gooey from chunks of melting Stilton. 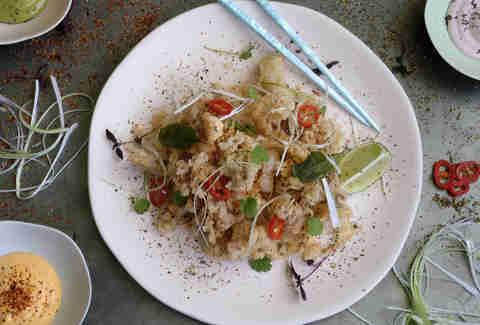 Chef Seb Holmes has worked at The Begging Bowl and Smoking Goat, two of London’s top Thai restaurants. There are big plans in the pipeline for his new project, Farang, but for now, you can find him developing his dishes on the streets. 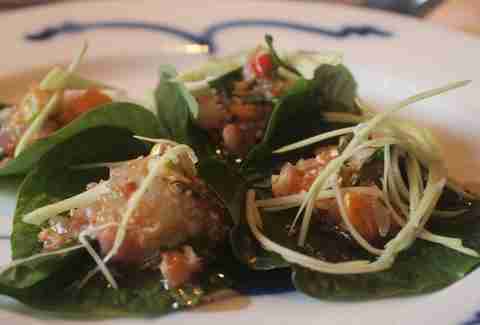 However, they don’t really need developing; his way with spices is hard to beat, making every mouthful a taste sensation. The menu changes all the time, but the regularly appearing smoked chicken green curry is a good example of his work, the juicy meat complemented perfectly by a fiery blanket of bright green sauce. Al-Andalus Moorish cuisine isn’t one you come across every day, but if it’s all as good as Nazari’s food, it’s worth keeping an eye out for. 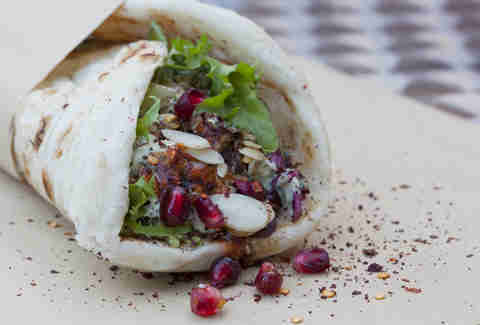 The combination of Middle Eastern and Mediterranean flavours blended into well-stuffed wraps will leave even your favourite kebab shop in the dust. Roast chicken is tossed in its own garlic-and-parsley-soaked juices, and Moorish spices help ensure that there’s heaps of taste in every bite. The soft, crisp falafel balls are made mainly with British-grown fava beans, and za’atar-sprinkled chips make sure you’re truly stuffed… plus, it's all served with a smile from an adorable 1974 Peugeot J7 van. It’s smoked fish, but not as you know it. Allihopa’s beautiful trout is smoked in Jacob’s dad’s garden in Norfolk, then presented as a sort of Scandi lunchbox, featuring open sandwiches on fresh-cut sourdough and rye breads, served with a dollop of potato salad and fresh, crunchy pickles. The smoked fish burger is pretty special, too, wedged into a potato bun with plenty of herby toppings. Oysters are pretty special any day of the week, but if you track down Decatur’s chargrilled bad boys on a Saturday morning, your shellfish world will be moved, guaranteed. Wild Essex oysters are topped with garlic butter and a little pecorino cheese, a dash of hot sauce, and a sprinkle of the house spice mix, then heated on an open grill until they’re hot, melty, and better than you ever thought a mollusk could be. Sign up here for our daily London email and be the first to get all the food/drink/fun in the capital.